Album opener, “Mechanized Death” begins with the machine-sounds of shuttering and hissing, but beyond those initial moments Columbus, OH's Day Creeper stick to the visceral on Hell Is Real. Scheduled for an October release on Tic Tac Totally, Hell is Real is vintage Ohio rock, boozy but not broken, clever and a bit mean-spirited, but all in all made with care in the warmth of a basement. Ohioans are born with the reflex to ego check. I know it because I have it. 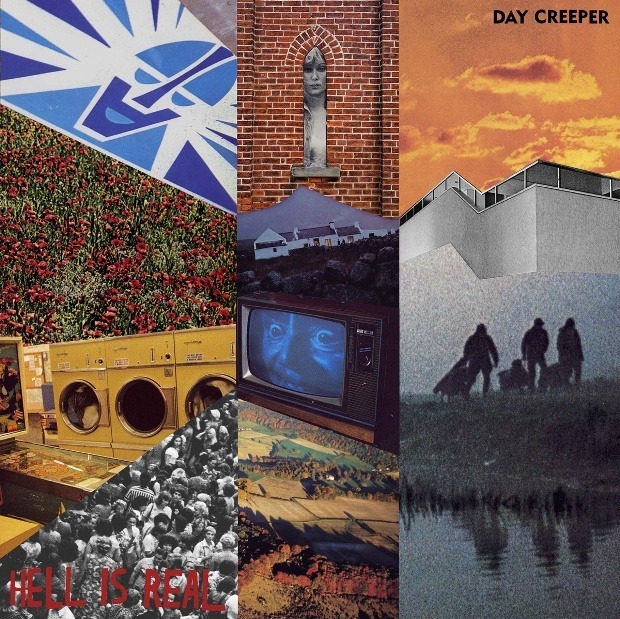 I have it like Pete Laughner had it when he wrote “Ain't It Fun”, like Times New Viking had it when they wrote “Move To California”, and Aaron Troyer of Day Creeper definitely has it on Hell Is Real. He sneaks it into the good times pop punk formula that will provoke comparisons to Pavement and early The Replacements. However, in an interview with Agit Reader, Day Creeper said their power trio formed out of a Thin Lizzy cover band. The Thin Lizzy element is there, and hell, while I'm at it let's just say Big Star, but not actually do anything with that. Day Creeper excel at softing their sarcasm in catchy numbers reflecting the arsenal of The Kinks or the alt-tenderness of Alex Chilton. You'll love “Everybody Else”, finding so much relatability in the chorus, only to realize after some 20 listens it applies to your band. How you deal with it once it becomes clear Troyer just cut you down to size comes down to whether you're from Ohio or somewhere else. If the HuffPo article regarding the misguided mindset of a Gen Y yuppies crushed your spirit, you're not prepared for Troyer's “when you get that feeling that you started something new / everybody else feels the same way too” refrain. It's gonna be an early Monday visit to the freezer for that quart of Rocky Road. Day Creeper's Hell Is Real is out October 1 on Tic Tac Totally.